In 1969 Michel applied to study biochemistry at the University of Tübingen. As part of the course, in 1972-3 he worked for one year in the various biochemistry laboratories at the University of Munich and the Max-Planck-Institut für Biochemie. After the examination in Tübingen in 1974 he did the experimental part of his biochemistry diploma in Dieter Oesterhelt's laboratory at the Friedrich Miescher-Laboratorium of the Max-Planck-Gesellschaft in Tübingen. In cooperation with Walter Stockenius, Dieter Oesterhelt had discovered bacteriorhodopsin in halobacteria and later proposed that it acts as a light-driven proton pump in the framework of Peter Mitchell's chemiosmotic theory. During his diploma work he characterized the ATPase-activity of halobacteria. In 1975, Dieter Oesterhelt moved to Würzburg. Michel joined him, working on the correlation between the intracellular levels of adenosine di- and triphosphate with the electrochemical proton gradient across the halobacterial cell membrane for his doctorate. On the basis of experimental work, he became convinced that it should be possible to crystallize membrane proteins like bacteriorhodopsin, which was considered impossible at that time. With Oesterhelt's help he started the experiments, obtaining a new two-dimensional membrane crystal of bacteriorhodopsin only four weeks later. It was not the three-dimensional crystal they wanted, but it allowed Michel to travel to the MRC at Cambridge, England, to undertake electron microscopical studies with Richard Henderson. Back in Würzburg, they observed the first real three-dimensional crystals of bacteriorhodopsin in April 1979. The success led him to cancel plans to do post-doctoral studies with Susumu Ohno, Duarte, California, on sexual differentiation in mammals. Instead, he moved with Dieter Oesterhelt again, this time to the Max-Planck-Institut für Biochemie at Martinsried near Munich, where Oesterhelt became a department head and director. An advantage of the move to Martinsried was the possibility of cooperation with Robert Huber and colleagues, who had established a very productive department for X-ray crystallographic protein structure analysis at the Max-Planck Institut. The bacteriorhodopsin crystals were found to diffract X-rays, but were too small and too disordered for structural analysis. Michel spent four months at the MRC in Cambridge, England in 1980, working with Richard Henderson, in order to perform X-ray experiments. Frustrated by the lack of success with bacteriorhodopsin, he tried to crystallize several other membrane proteins, mainly photosynthetic ones. After developing a new isolation procedure he obtained the first crystals of the photosynthetic reaction centre from the purple bacterium Rhodopseudomonas viridis at the end of July 1981. During September 1981 the first reaction centre crystal was X-rayed by Michel and Wolfram Bode, and turned out to be of excellent quality. In February 1982, Michel started the data collection for the X-ray structure analysis of the reaction centre project. In April or May he gave a seminar in Robert Huber's department and asked officially for collaboration. 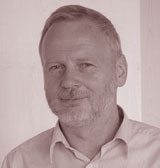 Johann Deisenhofer joined the project. Kunio Miki, a Japanese post-doctoral research associate in Robert Huber's department, helped to evaluate the pile of X-ray films. After the preliminary tracing of the peptide chains by Johann Deisenhofer, the sequence determination was performed by Karl A. Weyer, Heidi Gruenberg and Michel. In October 1987 Michel took up a position as department head and director at the Max-Planck-Institut für Biophysik in Frankfurt/Main, West Germany, where he has been ever since. As a result of his success with the crystallization of membrane proteins and the elucidation of the three-dimensional structure of the photosynthetic reaction centre from the purple bacterium Rhodopseudomonas viridis he received various prizes and awards, including the Biophysics Prize of the American Physical Society (together with Deisenhofer), the `Chemiedozentenstipendium' of the Fonds der Chemischen Industrie, the Otto Klung-Preis for chemistry, the Leibniz-Preis of the Deutsche Forschungsgemeinschaft and the Otto-Bayer-Preis (together with Deisenhofer). The information on this page is based on content at Nobelprize.org © The Nobel Foundation and Hartmut Michel's home page at MPI Biophysik.